Getting there: Take the N1 from Cape Town. Then Exit 47 and turn right onto the R44. Continue to the Simondium Road. Turn left and continue past Babylonstoren to the junction with the R45. Turn right and continue to Franschhoek. Turn left at La Cotte Street and continue up the road to La Cotte. Allow about an hour to get there! 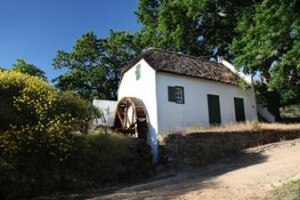 According to Hans Fransen, the farm was first granted to a Huguenot, Jean Gardiol, in 1713. The T-shaped farmhouse now has a corrugated iron roof and clipped gables, the front gable bearing the date 1836. With the plaster removed the position of the original casements can be clearly seen. There are number of interesting outbuildings forming the werf, as well as an overshot water-mill a short distance away.. 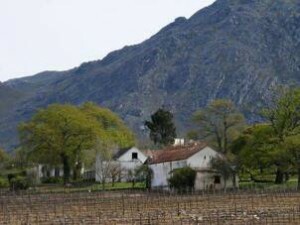 Please read the original La Cotte article in the VASSA Journal (Number 11 June 2004) on the VASSA website (under Publications/Journals) so that you arrive well informed! PLEASE NOTE: Outings are for paid-up members of VASSA only! Join VASSA by clicking on the Join VASSA link on the right of this page.